Make sure that all occupants are wearing their seat belts before driving the vehicle. Extend the shoulder belt so that it comes fully over the shoulder, but does not come into contact with the neck or slide off the shoulder. Position the lap belt as low as possible over the hips. Adjust the position of the seatback. Sit up straight and well back in the seat. Do not twist the seat belt. 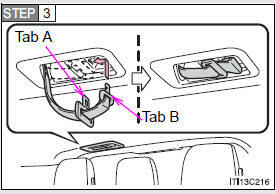 Push the tab into the buckle until a clicking sound is heard. To release, push the release button on buckle A. Move the height adjuster up and down as needed until you hear a click. 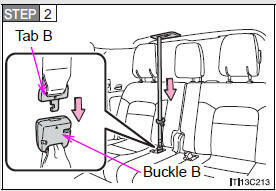 The pretensioner helps the seat belt to quickly restrain the occupant by retracting the seat belt when the vehicle is subjected to certain types of severe frontal collision or a vehicle rollover. The pretensioner may not activate in the event of a minor frontal impact, a side impact or a rear impact. If the system determines that emergency braking is being performed or the vehicle is out of control, the front seat belts will retract. If the system determines that a collision is unavoidable, the front seat belts will retract before the collision. The retractor will lock the belt during a sudden stop or on impact. It may also lock if you lean forward too quickly. A slow, easy motion will allow the belt to extend, and you can move around fully. 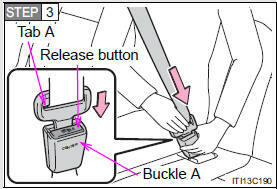 When a passenger’s shoulder belt is completely extended and then retracted even slightly, the belt is locked in that position and cannot be extended. 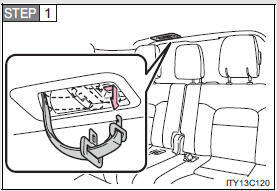 This feature is used to hold the child restraint system (CRS) firmly. To free the belt again, fully retract the belt and then pull the belt out once more. Put your fingers between the seat belt and the holder. The seat belts of your vehicle were principally designed for persons of adult size. Use a child restraint system appropriately for the child, until the child becomes large enough to properly wear the vehicle’s seat belt. When the child becomes large enough to properly wear the vehicle’s seat belt, follow the instructions on P. 76 regarding seat belt usage. If the vehicle is involved in multiple collisions, the pretensioner will activate for the first collision, but will not activate for the second or subsequent collisions. If your seat belts cannot be fastened securely because they are not long enough, a personalized seat belt extender is available from your Toyota dealer free of charge. Observe the following precautions to reduce the risk of injury in the event of sudden braking, sudden swerving or an accident. Failing to do so may cause death or serious injury. Ensure that all passengers wear a seat belt. Always wear a seat belt properly. Each seat belt should be used by one person only. Do not use a seat belt for more than one person at the same time, including children. Children should be seated in the rear seat and always use a seat belt and/ or an appropriate child restraint system. 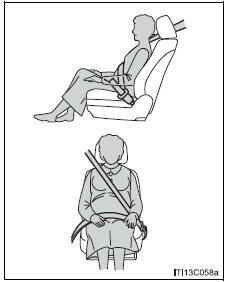 Do not recline the seat any more than necessary to achieve a proper seating position. The seat belt is most effective when the occupants are sitting up straight and well back in the seats. Do not wear the shoulder belt under your arm. Always wear your seat belt low and snug across your hips. Obtain medical advice and wear the seat belt in the proper way. Women who are pregnant should position the lap belt as low as possible over the hips in the same manner as other occupants. Extend the shoulder belt completely over the shoulder and position the belt across the chest. Avoid belt contact over the rounding of the abdominal area. If the seat belt is not worn properly, not only a pregnant woman, but also the fetus could suffer death or serious injury as a result of sudden braking, sudden swerving or a collision. Obtain medical advice and wear the seat belt in the proper way. Do not allow children to play with the seat belt. If the seat belt becomes twisted around a child’s neck, it may lead to choking or other serious injuries that could result in death. If this occurs and the buckle cannot be unfastened, scissors should be used to cut the belt. 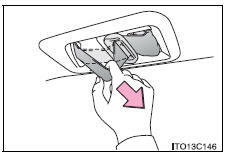 Do not place anything, such as a cushion, on the front passenger’s seat. Doing so will disperse the passenger’s weight, which prevents the sensor from detecting the passenger’s weight properly. 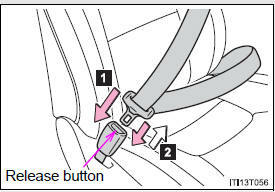 As a result, the seat belt pretensioner for the front passenger’s seat may not activate in the event of a collision. If the pretensioner has activated, the SRS warning light will come on. In that case, the seat belt cannot be used again and must be replaced at your Toyota dealer. Always make sure the shoulder belt is positioned across the center of your shoulder. The belt should be kept away from your neck, but not falling off your shoulder. Failure to do so could reduce the amount of protection in an accident and cause death or serious injuries in the event of a sudden stop, sudden swerve or accident. 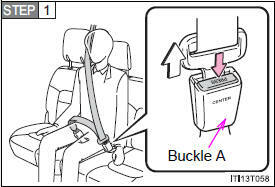 Do not use the third center seat belt with either buckle released. Fastening only one of the buckles may result in death or serious injury in case of sudden braking, sudden swerving or a collision. Do not damage the seat belts by allowing the belt, plate or buckle to be jammed in the door. 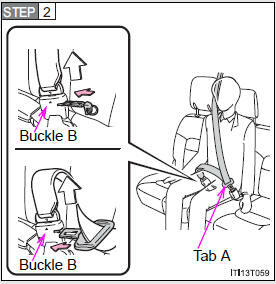 Inspect the seat belt system periodically. Check for cuts, fraying, and loose parts. Do not use a damaged seat belt until it is replaced. Damaged seat belts cannot protect an occupant from death or serious injury. Ensure that the belt and tab are locked and the belt is not twisted. If the seat belt does not function correctly, immediately contact your Toyota dealer. Replace the seat assembly, including the belts, if your vehicle has been involved in a serious accident, even if there is no obvious damage. 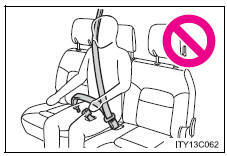 Do not attempt to install, remove, modify, disassemble or dispose of a seat belt. Have any necessary repairs carried out by your Toyota dealer. Inappropriate handling of the pretensioner may cause it to activate or operate improperly and may cause death or serious injury. Do not wear the seat belt extender, if you can fasten the seat belt without the extender. Do not use the seat belt extender when installing a child restraint system, because the belt will not securely hold the child restraint system, increasing the risk of death or serious injury in the event of a sudden stop, sudden swerve or accident. 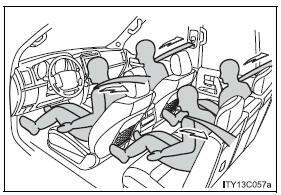 The personalized extender may not be safe on another vehicle, when used by another person, or at a different seating position other than the one originally intended. 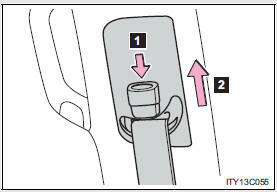 When releasing the seat belt, press on the buckle release button on the extender, not on the seat belt. This helps prevent damage to the vehicle interior and the extender itself.